This concealer is very full coverage. It almost completely covered my dark circles and I instantly felt like my face was brighter and that I looked more awake. A little goes a long way with this product. When I first used it, I used too much. This may have been due to the fact that you need to twist the applicator to release product into the sponge and it took me a bit to get some product there the first time. I really enjoy using this type of applicator. The sponge is a great size and shape for sweeping under your eyes. I was slightly disappointed in the colour. I purchased the second lightest shade thinking it would suit my warm undertones better, but still found it a bit too dark for my skin tone. That being said, with some blending it still gives me good coverage without leaving harsh lines. In terms of lasting power it lasts for a full day without wearing away or fading. However, it can be slightly visible and sit on top of your skin at the end of a long day. 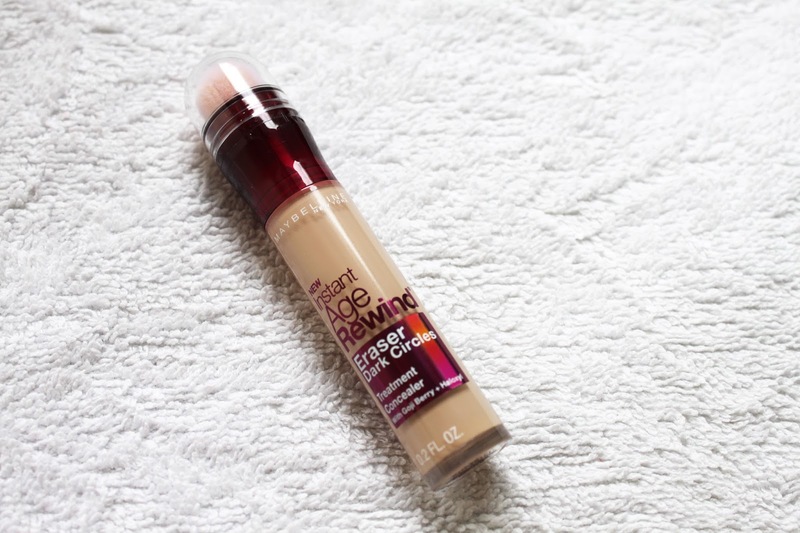 Overall I am super impressed with this product and it is now my go to concealer! Have you tried Instant Age Rewind Eraser before? I've been wanting to try a new concealer for so long, I can only use the Collection one in Fair because it's the only shade that suits my caspar-the-ghost-like complexion haha! I've just stumbled across your blog and I know I'll be a happy regular reader of yours, keep posting! I've been wanting to try Collection for a while. And thanks very much! I really want to try Collection! That's a good idea, thanks for the tip! I've always wanted to try this one too! My bags are terrible so with your good words I think I will have to give it a go next time I'm out and can find the right colour! Maybe give the lightest one a go? It's a product worth trying! I love both these concealers! I'll have to check that one out! Havne't tried it yet but I have it in my wishlist too. Maybelline has some good concealer range!